The story of The National Picture Theatre continues. The National Picture Theatre, on Beverley Road, Hull. On the evening of 18th March 1941 the audience in the National Picture Theatre on Beverley Road were watching Charlie Chaplin in ‘The Great Dictator’ when ‘Air Raid Alert’ came up on the screen. People were used to these warnings by this stage in the war, and there was no panic. People moved to the back of the auditorium where the concrete balcony promised added protection. Those who ventured into the foyer and looked outside judged that they were safer staying where they were than chancing reaching the public shelters. Suddenly a parachute mine dropped behind the screen end of the cinema and exploded. That end of the auditorium was completely demolished. But the audience had judged right; the robust construction of the foyer and circle had saved them. No-one was killed or injured, and the relieved audience members were eventually able to make their way to shelters or home. Next day Council workers took down some dangerously leaning walls and then the rest of the building was left, just one of many bomb sites in Hull. Eventually the National reopened on the opposite side of Beverley Road next to Stepney Station. The front of the bomb site, like many others, was screened by an advert hoarding. And that’s how it stayed. A generation of children in the 1940s and 50s grew up with bomb sites as their adventure playgrounds. Tom Robinson was one of them, and when in the late 1990s he was showing his granddaughter where he used to play, he was struck with how this site was a rare survivor. As it happened, English Heritage agreed. They had been researching surviving World War 2 structures and found that this was the only building in England that had survived as a bombed ruin and was not a church or a military building. The fact that it was a cinema, a place where ordinary people had gone to learn the latest news and be entertained, made it especially poignant as a reminder of the experience of civilians in World War 2. The remains were given Listed Building status for their historic interest in 2007. A group of us formed a trust to save the building. It’s been a long struggle but at last we are seeing some progress. 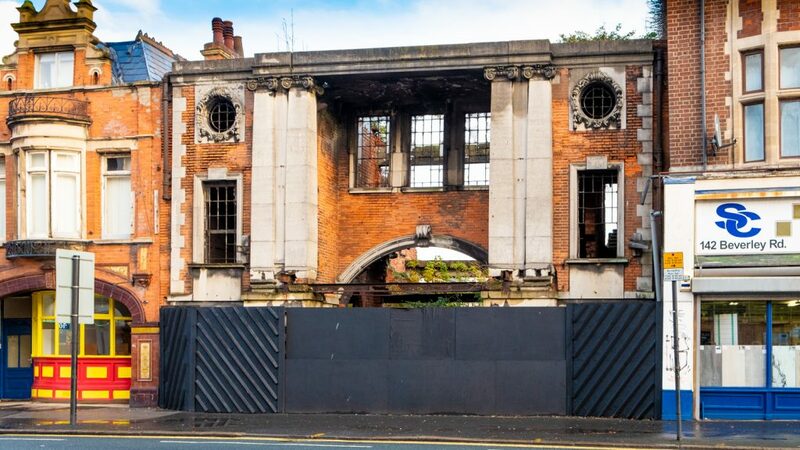 The Council has acquired the building and site, and together we have applied to the Heritage Lottery for funding towards the cost of stabilising the remaining structure and interpreting it so that people can understand its significance. We hope to hear very soon whether we have been successful. In the meantime, of course, we need to raise funds to make our own contribution to the many expenses that will be involved in this project, and to engage as many people as possible. We give illustrated talks, have stalls and exhibitions at events, and organise a popular ‘wartime meal’. On Saturday 1st December we will be putting on our popular ‘old fashioned afternoon at the pictures’ from 12 noon to 5pm at Kardomah94 on Alfred Gelder Street in Hull. There will be some classic comedy from Charlie Chaplin, Laurel and Hardy, Buster Keaton and others, followed by the feature film ‘It’s a Wonderful Life’. Produced and directed by Frank Capra and starring James Stewart and Donna Reed, this film, released in 1946, is now regarded by the American Film Institute as the ‘most inspirational American film of all time’. Interestingly, the film’s producer came under suspicion from the FBI who considered that its depiction of a banker as a villain was ‘a common trick used by Communists’. Tickets are £5 in advance from Kardomah94 café, www.HullBoxOffice.com or by ringing 01482 445747. They are £6 on the door. Don’t miss the next ‘old fashioned afternoon at the pictures’ on Saturday 16th March 2019 when the feature will be ‘The Dam Busters’. Be the first to comment on "The story of The National Picture Theatre continues."